Pavement management will make use of a new generation of technology so agencies are less dependent on manual labor for data collection. 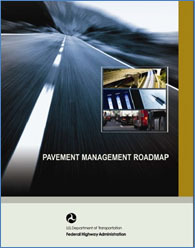 Pavement management tools will allow agencies to communicate effectively with stakeholders, using clear statements that are tied to agency goals and pavement worth. Within an asset management framework, pavement management will be used for investigating decisions and program options in both private and public sectors. A pavement management analysis will consider new materials and construction/design practices, as well as other factors that influence project and treatment selection, including safety, congestion, and sustainability. As a result of these changes, pavement management will be robust, comprehensive, and credible, and will address agency needs at the project, network, and strategic levels. Please explore these links to find out more about the Roadmap, current progress against Roadmap goals, and activities related to fulfilling the vision of the PM Roadmap.